The “Canalway Grants Program” includes up to $1 million in competitive grants available to eligible municipalities, and 501(c)(3) non-profit organizations along the New York State Canal System for canal - related capital projects. The minimum grant request amount is $25,000. The maximum grant request is $150,000. Grant administration and pre-development costs shall not exceed 10% of the grant award amount. These costs may be used as part of the applicant match, though, with no cap. and Regional Economic Development Councils Strategic Plans http://regionalcouncils.ny.gov/. Priority in this round of funding is being given to projects that recognize and support the bicentennial of the Erie Canal between 2017 and 2025 and result in noteworthy and sustainable recognition of the Canal System's significance, relevance, and heritage during and after the 2017-2025 bicentennial of Erie Canal construction. 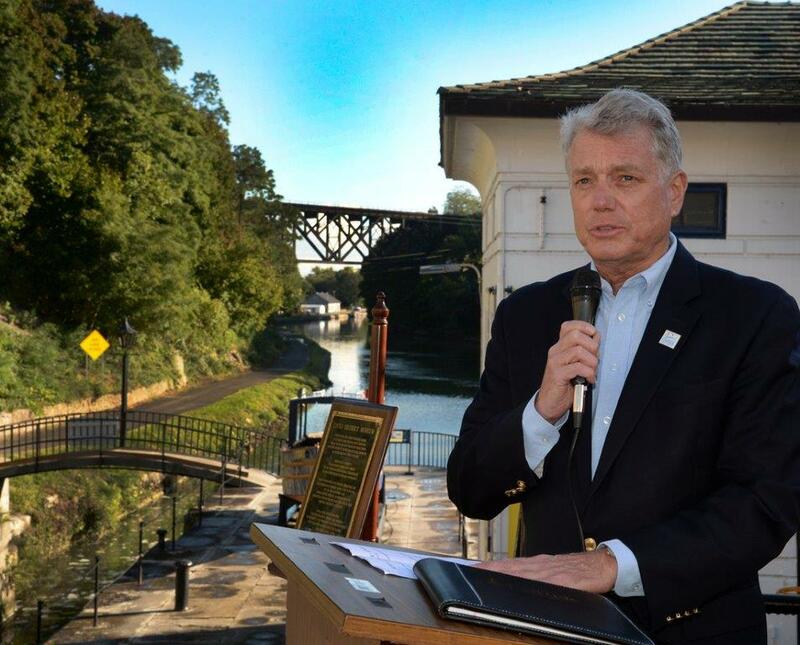 The Canal Corporation's goal for the Erie Canal Bicentennial Celebration is to strengthen the Canal's identity by raising public awareness of the historical and current impact of the Canal, expand community engagement and participation in canal programs; and increase investment in the canal to generate economic and cultural benefits for all communities ensuring an enduring legacy. Information on the history of the canal can be found at: http://www.canals.ny.gov/history/history.html. If an application is made for trail related construction, priority in this round will be given to projects that connect to or enhance the Empire State Trail initiative. Applicants are also encouraged to explore additional state agency funding sources for historic preservation, waterfront development, recreational access and tourism marketing projects and/or programs. Projects proposed for Canal funding should preserve and rehabilitate canal infrastructure, enhance recreational opportunities for water-based and land-side users, promote tourism, economic development, and revitalization in the canal corridor and enhance the connections between the canal and the corresponding region. Funding can be used to expand public access, increase recreational use, improve services for motorized and non-motorized boaters, improve services for Canalway trail users, and stimulate private investment along the NYS Canal System. Canal CFA projects are expected to offer a greater appreciation and understanding of canal and community history, and to promote the protection of environmental and historic canal resources. Priority consideration will be given to proposals which demonstrate they will advance downtown revitalization through transformative housing, economic development, transportation and community projects that will attract and retain residents, visitors and businesses - creating dynamic neighborhoods where tomorrow's workforce will want to live, work, and raise a family. Each REDC may develop region-wide strategies, or may focus its efforts by designating one or more chronically distressed community as an "Opportunity Area." Projects seeking to apply CFA funds for the purpose of eliminating barriers to skilled employment by poor people in your region, as identified by the Opportunity Agenda and Strategic Plan, should provide evidence of such in their application. New York State is home to more than 900,000 veterans, 72 percent of whom served in combat. In 2014. the REDCs were asked to create a Veterans Work Group to promote participation by Veterans in the CFA, and develop strategies to encourage other potential CFA applicants to include workforce goals related to Veteran's employment. This is part of a comprehensive approach to services to the veterans and military families in New York. Applicants should provide any information that links their project proposals to the Veteran's Initiative strategies identified by the REDCs. Not-for-profit corporations are subject to New York State's Not-For-Profit Corporation Law. In order to apply under this program, a not-for-profit corporation must have proof of incorporation (or equivalent document) from the NYS Department of State or NYS Board of Regents, a charities registration number from the NYS Office of the Attorney General, and proof of tax-exempt status under the IRS code. Eligible canal capital projects include, but may not be limited to: constructing new buildings, vessels or structures; constructing additions or improvements that enlarge, expand, enhance or extend existing buildings, vessels or structures; new systems in existing buildings, vessels or structures (HVAC, plumbing, electrical, mechanical, propulsion); substantial renovations or preservation of existing buildings, vessels or structures, including reconfigurations (removal or construction of walls, ceilings and flooring, windows, window frames, hulls); site preparation and improvements associated with a project (excavation, demolition, roadways, sidewalks, exterior lighting, sprinkler systems, utility hook-ups); acquisition of furnishings, fixtures, machinery and equipment with a useful life in excess of five years; constructing or rehabilitating segments of Canalway Trail; constructing or rehabilitating docks or bulkeaheads for the purpose of public access to and from the Canal System; and/or hazardous waste clean-up associated with a project. Boundary Eligibility: Projects must be located along one of the four canals of the Canal System (Erie, Champlain, Oswego and Cayuga-Seneca), trail linkages or connections to existing Canalway Trail segments, or the historic canal alignment. Applicants must demonstrate a minimum of 50% matching funds. Eligible matching funds include federal, local, private and other agency state funding (Canal Corporation funds may not be used towards matching funds). Eligible match also includes the value of in-kind services and donations. See Award Criteria for more details on eligible match. The applicant is responsible for obtaining all required permits and approvals from federal, state, and local agencies, such as the U.S. Army Corps of Engineers, NYS Department of Environmental Conservation and NYS State Office of Parks, Recreation and Historic Preservation, and any others that may be required by the NYS Canal Corporation. Please note that the New York State Canal Corporation is subject to the State Smart Growth Public Infrastructure Act (Chapter 433 of the Laws of 2010) and must, to the extent possible, make funding decisions consistent with the provisions of that Act. For projects proposed by a municipality, the municipality will be lead agency for purposes of the State Environmental Quality Review Act (SEQRA) or will be responsible for initiating lead agency designation procedures, if there are other involved agencies. For new projects initiated after receipt of the grant award letter, the Canal Corporation shall be an involved agency. The municipality shall meet the procedural and substantive requirements of SEQRA and all other state, federal or local law, rules, regulations, ordinances, codes and requirements. For non-profit organizations, the Canal Corporation will determine whether it will proceed as lead agency, initiate the lead agency designation process or refer lead agency to the local municipality. If the project is a Type I or Unlisted Action, the Environmental Assessment Form will be required prior to contract for award. If a Determination of Significance has been established, documentation will be required prior to contract for award. Grant funds will be provided on a reimbursement basis ONLY. Receipts, invoices and other documentation must meet the requirements of the Canal Corporation and the Office of the State Comptroller. Reimbursement will only be provided for projects or portions of a project initiated after the date of the grant award letter from the Canal Corporation. Projects may be initiated prior to receipt of the award letter, and matching expense documentation will be accepted for expenses up to one year prior to the date of the award letter, but reimbursement will only be provided for portions of the project initiated after the date of the award letter. Reimbursement payments will not be issued prior to final contract execution. The Canal Corporation reserves the right to reallocate funding and grant awards based upon available funds and grant requests. Each project will be rated with the following evaluation criteria. Criteria #1, Regional Council Endorsement will carry 20% weight and an independent weighting committee will assign weights for criteria #2 through #10. Final ranking of project applications will be based on a weighted scoring. Is the project endorsed by the corresponding Regional Economic Development Council? Is the project consistent with the goals and objectives of the NYS Canal Recreationway Plan? Does it enhance an existing harbor, service port, lock project or the Canalway Trail, or improve public access to the Canal System and Canal related amenities? Does the project recognize and support the bicentennial of the Erie Canal between 2017 and 2025? Will the project result in a noteworthy and sustainable recognition of the Canal System's significance, relevance, and heritage during and after the 2017-2025 bicentennial of Erie Canal construction? Does the project connect to, or enhance the Empire State Trail Initiative, meeting at least one of the six targeted goals of this initiative? Is the project consistent with regional or intermunicipal plans, including NYS Department of State "Local Waterfront Revitalization Program" (LWRP), Erie Canalway National Heritage Corridor Management Plan, or other regional and local plans? Is widespread support from residents and other canal stakeholders demonstrated in the application? Are the project costs reasonable and clearly defined both in the Budget sheet and in the supporting documents? Is viable and accessible match clearly demonstrated in the grant budget? Can the project increase canal visitation and/or participation in canal related activities? Does the project protect or enhance historic and/or natural resources of the Canal System? Does the proposal reflect a reasonable and achievable timeframe for completion of the grant funded project including project milestones and identification of parties responsible for project oversight? Does the proposal define a reasonable and achievable strategy for the long term operation and maintenance of the project? A 50% match will be required on all grants and must be fully documented according to the requirements of the Canal Corporation and the Office of the State Comptroller. Cash: Includes grants other than this grant request. Force Account (Payroll of applicant): Itemize according to job title or job assignment (on project). At the time of the reimbursement request, grant recipients will be required to document time worked, tasks, pay ratio and payment (including components and percentage of fringe benefit rate). Professional Services: The value of services provided by professional and technical personnel and consultants. Three-year retroactivity applies. Supplies and Materials: The current market value of items warehoused (not yet installed). Three-year retroactivity applies; use value current at time items were obtained. (For example, a lawyer donating legal services may compute the value based on the standard billing rate, but the value for the same lawyer donating time painting walls will be computed up to the amount identified as the Value of Volunteer Time for New York State). Equipment Usage: Compute the value according to its fair market rental value in project location. Real Property: The value of all property acquired, donated or converted from other purposes should be included in the project schedule. One year retroactivity applies to all three categories. Canal Corporation assistance toward the costs of the project shall not exceed 50% of the approved project cost. The Canal Corporation shall not be responsible for any increases in the total project costs beyond the grant approval amount indicated in the award letter from the Canal Corporation. Qualifying match types include in-kind services, federal funding, other state funding, donated services or volunteer labor, force account (paid labor), supplies, materials and land acquisition (however, grant funds CANNOT be used for land acquisition.) Donated professional services should be valued at the prevailing hourly rate with overhead costs. Maintenance and operation of facilities receiving grants will be the responsibility of the applicant. All successful applicants will be required to enter into a formal contract and agree to other legal documents with the Canal Corporation to ensure the long term protection of the property and also restrict changes in the use of the property. A preservation covenant or conservation easement must be conveyed for work involving historic resources. The liability for projects constructed, owned and maintained by awardees on real property not under the jurisdiction of the Canal Corporation will remain with the grant awardees. Projects on Canal Corporation real property must be designed and constructed with Canal Corporation approval and in accordance with engineering and design standards of the Canal Corporation. Projects must provide for public safety and must not interfere with canal operations or navigation. Projects will be required to meet all applicable insurance requirements. Projects on Canal Corporation real property may require the purchase, lease or permitting of the real property from the Canal Corporation, in accordance with all applicable laws and regulations and the Canal Corporation's "Canal Real Property Management Policy" and standard operating procedures. Project plans must be reviewed and approved by the Canal Corporation before advertisement or contract letting. Every project must comply with all applicable local, state and federal laws, rules, regulations, requirements, ordinances and codes.